After coming back from a long weekend filled with turkey and cranberry sauce, we were eager to bring our readers a full week of news. We clued readers into another important pick from the incoming Trump administration and new plans from Brookdale Senior Living (NYSE: BKD). Here in the newsroom, we were wishing we had our own dancing robot like an assisted living community in China. The Department of Labor filed an appeal against a recently granted injunction that blocked an overtime rule from coming into effect on Dec. 1. The injunction pauses a rule that increases the exemption threshold for salaried employees who are eligible to receive overtime pay. The rule, if it were to go into effect, would impact more than 4 million American workers in virtually all sectors. As the appeals process begins, the outcome of the final rule is still up in the air, with greater uncertainty as the incoming Trump administration comes into office next month. Trump’s HHS Pick Offers Hope to Embattled Skilled Nursing Sector—President-elect Donald Trump has chosen Rep. Tom Price (R-GA), M.D.—an outspoken critic of the Affordable Care Act (ACA)—to head up the Department of Health and Human Services (HHS) in the new administration. Price’s appointment could be good news for the struggling skilled nursing sector, as he appears likely to roll back regulations and some ACA programs that have diverted business from skilled nursing facilities (SNFs). Brookdale Details New Supply Hitting Major Markets—New competition in certain areas hit Brookdale Senior Living hard in the third quarter of 2016. 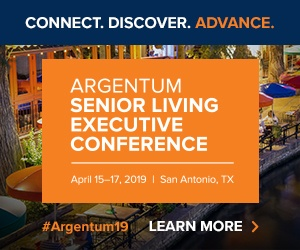 Now, the nation’s largest senior living provider has broken down supply pressures specifically within its largest 20 markets and shared some of it plans for facing the new competition. HCP, Brookdale Hammer Out Changes to Master Lease—HCP Inc. (NYSE: HCP) has taken another step in its ongoing efforts to reduce the number of Brookdale Senior Living properties in its portfolio. Three new amendments to its master triple-net lease with Brookdale will enable HCP to move forward with previously announced plans to terminate leases on 25 Brookdale communities and sell 64 others. How Creative Financing is Solving a Senior Living Puzzle—These days, senior housing is as enticing as a pie cooling on a windowsill—every one wants a piece of its hefty returns and promising long-term prospects. Yet, one of the most in-demand products—affordable housing—is still one of the industry’s biggest puzzles. To fill housing needs for low-income seniors, senior living players are finding that the right recipe to finance affordable projects requires a few extra ingredients with a mix of public and private funds. The Perils of Too Much Relaxation in Assisted Living—Too much help in assisted living means that seniors might slow down so much that it’s detrimental to their health, writes Margaret Danilovich in Forbes. NYU’s Plan to Make College Cheaper: Get Students to Live with Senior Citizens—New York University is helping students get cheaper housing by slating them into extra rooms in the apartments of New York seniors. I, Robot, Will Dance With Grandma—Across the globe, in the Chinese city of Hangzhou, seniors at an assisted living center have a new dance partner—a small robot name Ah Tie. Robotic helpers have entered the senior living space to entertain and help manage health care needs.